This is a picture of an idea — and an ideal. It is a picture of two fine young newlyweds — a tall, handsome, wholesome young bridegroom and a sweet not-so-tall young bride. They have stars in their eyes — stars of eternal hope and happiness. But the artist intended to suggest to us far more than this. He has here painted the dreams of every normal, healthy young man and young woman — a dream filled with a honeymoon, a happy home, laughing, loving children, faith, trust, honor, achievement — all these and a never-ending love and life together. Forever? Do they really mean forever? Not to end in divorce court as thousands of American marriages now do? Marriage till death? Yes, that long and longer — for even then separation forever would be tragedy. Theirs is the hope of eternal living and learning and loving together — an ideal — an eternal “togetherness” of parents and children in the old hallowed patriarchal pattern, consecrated and enriched by the blessings of a loving and eternal Father in Heaven so long as love and faith and fidelity shall endure. 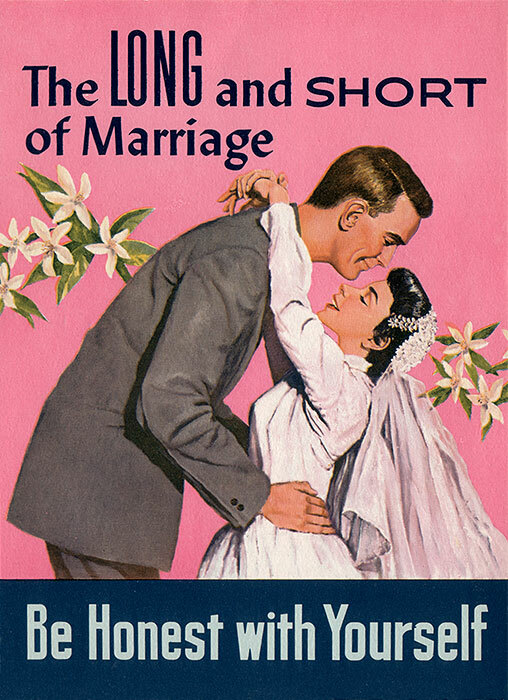 There you have it: the long and the short of marriage. Which will you choose?